Train stations are magical places. They are portals where we literally jump off to new destinations. They allow people with different lives and destinies to intersect. They are big. They are public. They are filled with promise, confusion, and noise. They can also be places of tragedy and sadness. I have had many memorable train station moments in my life, in India, Singapore, Malaysia, Egypt, Thailand, the USA, Canada, Japan, and throughout Europe. I have almost been robbed, lost my money, found friends, and often sat around for hours waiting to escape a few terrible places and even countries. Sam and Rick leave Paris without Ilsa, who just moments earlier had broken Rick’s heart with her farewell letter. And, yes, it has to be raining for such a scene. When I think of trains, I always think of the great train scene, set in Paris on a rainy June 1940 evening, as two protagonists get ready to flee the advancing Nazis. 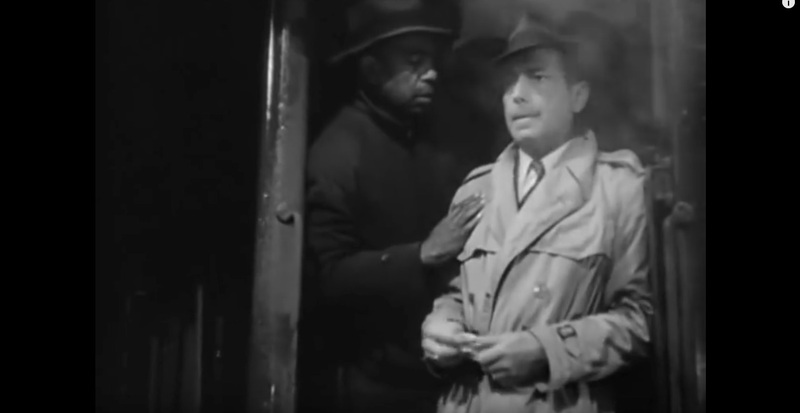 One is Humphrey Bogart’s Rick Blaine, and the other is his best friend Sam, played by Dooley Wilson. The film is the Warner Bros. 1942 classic Casablanca. Come on, you know the short scene. Sam shares the note from Rick’s lover, Ilsa, who is not seen in this sequence, but played by Ingrid Bergman. In her letter, she bids Rick what she thinks is her final farewell. Rick is devastated and watches the words melt away on the sheet in the downpour and his heart breaks apart right at that very moment. The scene ends with Rick tossing the toxic rejection missive aside, as he and Sam steam away, fleeing for what we know will be North Africa and eventually the film’s namesake, Casablanca. 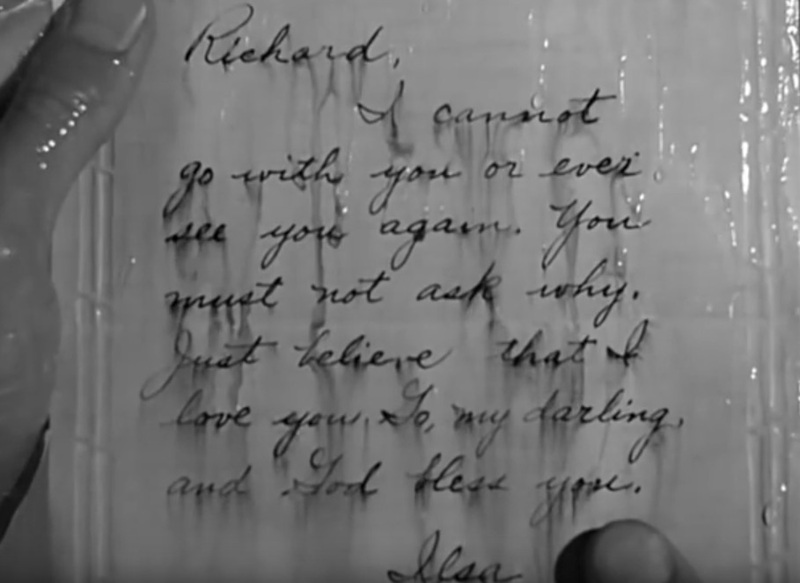 Ilsa’s goodbye letter to Rick in the 1942 Warner Bros. film Casablanca. I thought about that memorable scene yesterday, when I found myself at Union Station in Portland. It was raining. It also was colder than expected. I had dashed down to give a gift to a friend who was leaving town with a lot on her mind. The whole scene brought back a memory from about two years earlier, when another woman I knew had come to Portland, in the midst of a personal crisis, and I had dropped her at the station on a very rainy late fall day. I had listened to her story as well, and a few tears. I will leave out other scenes from my first Union Station episode, but it was a terrible day for the person I was with. My job, whether I wanted it or not, was to help her out and then to be forgotten. I was disposable in some ways. The event yesterday was not quite on that scale, but it had eerie echoes from the one before. I laughed at myself walking away from Union Station after I bid my friend farewell. So was I just the sap, getting caught in the rain, like Bogie, whose love interest left him for another man without saying goodbye in person? In both cases I was not the love interest, but I was barely a secondary character in the film unfolding for these two leads in their complicated lives. Clearly there are elements of an archetypal modern story at play when man and woman cross fates in railway stations: The man, feeling sappy and sorry for himself. The woman, crying over another man. The station as the stage, where the drama unfolds. And of course the beating rain, soaking the characters to their skin. On some days, you have to be Bogie’s Blaine, and stop thinking about yourself. That is OK. I have no regrets. It is fine to play the part of a tragic but complex character. But having lived this scene, I advise any future Ricks who are left behind, avoid the habit of being the one who leaves the station alone, drenched by rain and feeling nothing but regret. There are much better ways to end your stories. And don’t wait until the bad guys like the Nazis are practically knocking at the city gates. Leave town a lot earlier. Note: Use of images from the film Casablanca are solely for the purposes of comment and criticism.